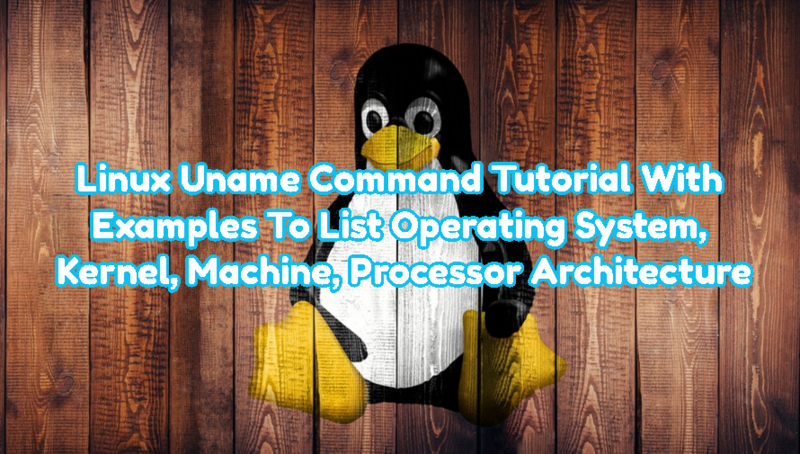 uname command is simple tool which provides information about the kernel, machine, processor, and operating system. There are a lot of more complex and feature applications that can provide more information but the simplicity makes uname best choose. We will use following syntax for uname command. Brief help can be displayed with the --help option. Kernel name is set by compiling kernel. Distributions generally provide their name in the kernel name or they set their original versioning convention. We can list kernel name with -s or --kernel-name option. We can display host name of the system with -n or --nodename options. The other name of the host name is node name. We can display kernel release information. This information may be useful while looking for security vulnerabilities or comp-ability options about application and kernel related tools. We will use -r or --kernel-release options. Kernel version provides information like when the kernel is compiled what distribution is is uses. We can display kernel version information with –v option. There are a lot of different type of processors in the IT world. ARM, X86, X86_64, MIPS etc. Each processor architecture requires kernel compiled for its architecture to work. We can get kernel architecture and related processor type with -p or --processor options. Operating system information can be listed with -o option. Up to now we have listed and displayed related information part by part. We can print and display all information in a single line with a single option. We will use -a or --all option. We can see that current system Linux Kernel version is 4.8 and operating system is Uubuntu.